A ROTARY club president was prompted to start an initiative which raised £3,000 for the hospital unit where his tiny grandson received some special care. Andy Becket, of the Rotary Club of Woking District, chose the Little Roo Neonatal Fund as the charity to support during his year in office. 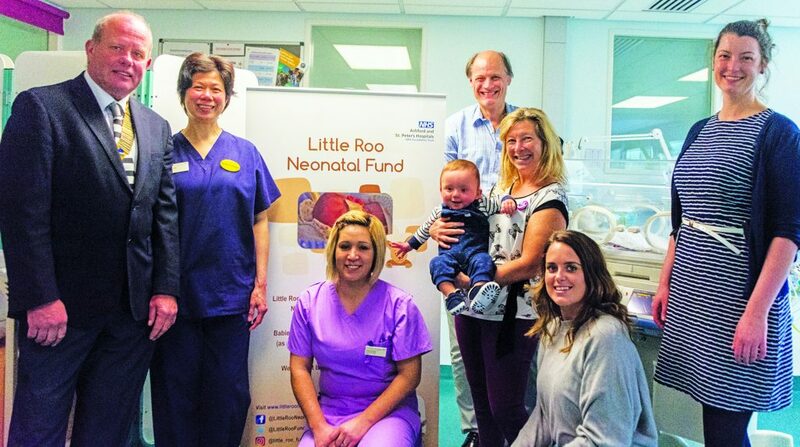 Little Roo raises money for the neonatal intensive care unit at St Peter’s Hospital in Chertsey. The unit looked after Andy’s prematurely born grandson, Blair Hathaway, for eight weeks at the beginning of 2018. The £3,000 donation was raised at a golf day organised by the club at West Byfleet Club in October. The St Peter’s unit has a total of 22 high dependency and special care cots. It usually has one nurse caring for two babies but some of its tiny patients need one-to-one care. Andy – along with one-year-old Blair and his mum Charlotte – visited the unit to meet the staff and see how donations from Little Roo are used. “It’s a real pleasure to see the donation go to such a worthy local cause that provides the only specialist neonatal intensive care unit in Surrey,” said Andy. Little Roo raises money for additional and replacement specialist equipment, sends staff for specialist training, and provides extra facilities for parents. St Peter’s family support co-ordinator Jo Willard said that the unit treats around 750 children a year and that the Rotary donation was a valuable contribution towards its costs and facilities for parents.